· Our unique ultra pilot system that virtually eliminates outages and automatically shuts off all gas if one should ever occur. · Dual shut-off valves ensure 100% gas shut-off for safety. · Continuous fan switch circulates room air continuously during summer or winter operation to improve comfort. · Built-In coil cabinet allows fast and easy add-on of split system air conditioner and heat pump. · High-efficiency operation meets all federal energy efficiency standards. · Choice of air conditioning ready furnaces allows easy hook up of a matching cooling system to further improve your year-round comfort and efficiency. · For 80+ AFUE models, multiple configurations available in the M1 Series (pictured above), and in the classic CMF Series. · For 90+ AFUE models, configurations are available in upflow and downflow series. Since 1916, Miller has been an integral part of improving the comfort of manufactured homes.Today, the manufactured home is a sophisticated, affordable home that is a smart choice for many buyers. Equally smart is knowing that your manufactured home furnace is just that — a manufactured home furnace. Specifically designed for your manufactured home, Miller furnaces are the most reliable heating source for your home. And as expected, the most reliable cooling source is a Miller air conditioner. Our air conditioners and furnaces are designed and tested to perform at their best efficiency, and highest reliability when installed together in a manufactured home. And the more you learn about our manufacturing process, the more you'll see that no other heating and cooling manufacturer compares to Miller's product quality — quality made possible through Demand Flow Technology. While other companies test products at random, we use 100% computer-automated testing on every Miller product to eliminate human error in the final analysis of product quality. We are the only heating and cooling manufacturer to be DFT certified. Miller has been a household name in the manufactured housing industry, with over 80 years of experience. 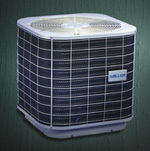 Miller heating and cooling product line consists of high to extra-high efficient furnaces, air conditioners, heat pumps, water heaters and fireplaces. Given our history and dedication to the manufactured housing industry, it is easy to see why most new manufactured homes are built with our heating systems, and when applicable, are equipped with our cooling systems too. You can rely on your Miller expert to make your home more comfortable with AireCare electronic air filters, programmable thermostats and other manufactured home accessories. It's a comfort to know that Miller is made for your manufactured home, and it's a comfort you can feel.